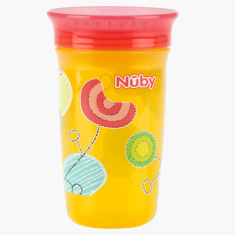 Nuby Printed 360 Angle Sip Wonder Cup - 300 ml | Yellow | Non-Spill. Drinking water, juice, or any other liquid will be fun for your little one when you serve it in this printed wonder cup. The rim is shaped in such a way that your child can drink from any side. This non-spill BPA-free cup comes with a cover to safeguard the contents inside. Feature 3 : 360' rim helps to deink from all side.